Sadly I don’t get the chance and time to go to San Francisco as often as I should. But every time I do, I’m never unimpressed with the serene atmosphere and relaxed people. But today was not just any practical day. When I saw a fellow blogger’s ode to a YSL exhibition at none other than the de Young Museum in Golden Gate Park (which in itself is gorgeous scenery), I had to hop on public transportation to see this for myself. As most of you fashion people should know, the great Yves Saint Laurent died in June of this year and fashion has never suffered greater. In his work, a true lover of fashion can see the insight and determination this man put into his work. His influences were boldly stated in his work, from artists such as Braque and Shakespeare to exotic cultures of Spain and China. Each collection had varying textures (with gawking mixtures of rooster feathers, velvet, sequins, beads, wood, plastic, and chiffon), but the thing that seemed to be holding each collection together was the immense amount of precision and love put into every single piece of Laurent’s looks. 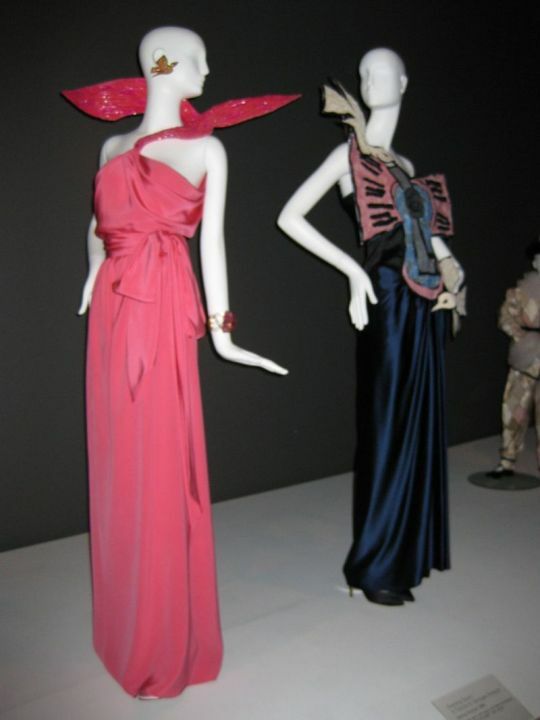 If you take time to read the side notes about the era and intention behind each collection (which me and my friends did…for about two hours) you can almost sense what YSL was thinking at the time. His craftsmanship was so tailored towards the practical woman of the generation that he never seems to go out of style. I even saw the influence of stars (which were recently recreated last season as accessories)!! There’s so much I can say before you actually visit the exhibit itself and breathe the tip of essence that YSL evolved to become. Visit the de Young Museum located inside the Golden Gate Park by taking the AC Transit F bus all the way to the San Francisco Terminal ($0), then walk downstairs to the take the Muni 5 ($1.50 for both ways) to Fulton St. & 8th Ave., and enter the park and you’ll see signs directing you there. With a student ID and Muni bus pass, the ticket costs you $14. The museum holds this exhibit till April 5, 2009 and is open Tuesday through Sunday, 9:30 a.m. to 5:15 p.m.; Fridays until 8:45 p.m.. There’s no excuse not to visit this exhibit for such a relatively low price. Yay! That's awesome John! So glad you went! You don't have any more pictures from your trip?? =( Boo! Do they not let you take pictures inside? Why have I not gone? What am I, stupid?